Also, a look into whether the Seahawks really had much of a tailback-by-committee and other topics in our latest mailbag. It might be snowy in Seattle, but we’re always ready to heat things up in the Seahawks Mailbag. In fact, with the NFL combine now just a bit more than two weeks away — officially starting Feb. 26 — it sort of feels like the NFL offseason is beginning to really pick up. So here’s the first of what will be a few mailbags we’ll scatter over the next week or so. On to the questions. A: For sure. All 32 NFL teams are going to be scouting the new Alliance of American Football, which debuted to some pretty good television ratings Saturday (though it might be too early to declare the league a success just yet; recall the sterling ratings start the original XFL got off to before plummeting). But one thing that will help its long-term viability is that it has the backing of the NFL — hence, games being telecast on the NFL Network — with many in the league hoping it can make it and serve as something of a developmental avenue for the NFL itself. However, and not to rain on the parade of what seems a fun venture — I watched much of the games myself — but most of the players in the league are far from unknown, and many have been with and cut by several NFL teams already. Meaning, there might be a diamond in the rough found here or there, and certainly some guys are going to get some needed work that might help them in their next chance, but there’s not really a ton of guys in the league whom NFL teams already don’t know about. I counted 22 former Seahawks on the rosters of the eight Alliance teams, including former draft choices Terry Poole and Eric Pinkins (each with San Diego) and a few fairly veteran guys such as defensive tackle Sealver Siliga (who has had a couple of Seahawks stints and earned a Super Bowl ring with the Patriots in 2014), linebacker John Lotulelei (who was one of the Seahawks’ training camp surprises of 2013 and on the initial 53-man roster for the team that would go on to win the Super Bowl that year), defensive end Damontre Moore (who had a sack for San Diego) and cornerback Trovon Reed. I also wonder a little how rules such as allowing no more than five players to rush the passer will impact evaluations — the ability to communicate and pick up blitzes and pressures is such a big part of being an offensive lineman and that rule negates that quite a bit, turning it much more into a lot of one-on-one battles (though maybe that’s what everyone wants). As Pro Football Talk noted, the restrictions on blitzing might make quarterbacks and offensive linemen look better than they really are. But any development is good development and the Seahawks will undoubtedly sign a player or two who has been in the Alliance — Alliance contracts allow for players to leave for the NFL at any time. Let Earl walk and use money to sign Fluker and others? A: To start, Earl Thomas is going to walk. Thomas is going to want to see what’s out there — and likely going to want a lot more than what Reid got and will initially ask for more than the $10 million a year he was getting with the Seahawks. It’s thought he wanted more than $14 million a season, which would make him the highest-paid safety in the NFL. If Seattle didn’t want to pay that last year, there’s no reason to think they would now, a year later, with all that happened last season (the broken leg, the ‘We’re No. 1’ salute on his way off the field, etc.) and Thomas now a year older and coming off another significant injury. So, to address your question, I think Seattle’s financial models for this season long ago took into account not having Thomas around. As for Frank Clark walking, that’s not going to happen. Pass-rushers are more valuable than ever in today’s NFL and Clark is Seattle’s only elite edge rusher, one of the top 10 or so in the league. Carroll has said several times the Seahawks will keep him around — and that’s not something he has said as openly and as often about other such situations. Seattle might not immediately work out a long-term contract with Clark, who can become a free agent March 13. But the Seahawks can slap him with a franchise tag, as I detailed last week, beginning Feb. 19, a period that lasts through March 5. Teams often wait until the end of that period to use the tag, seeing if they can work out a long-term option first. But if there is no long-term deal reached over the next few weeks, it’d be a surprise if the Seahawks didn’t tag Clark to assure he stays with the team in 2019, at a contract that will be near or at $18 million. I think at this point K.J. Wright is going to hit free agency. But I do think the door is being left open with Wright to return depending on how his market unfolds, sort of as happened a few years ago with Jermaine Kearse or last year with Mike Davis and Byron Maxwell. As for D.J. Fluker, he and fellow guard J.R. Sweezy can each be free agents in March. I’d expect the Seahawks to retain at least one of them, with the market dictating if they’ll be able to keep both. Carroll has said they’d like to keep the entire 2018 offensive line together if they can — right tackle Germain Ifedi, center Justin Britt and left tackle Duane Brown all remain under contract through at least the 2019 season (Britt was among a few Seahawks who had part of their 2019 salary become guaranteed last week. Britt had $2.25 million of his $4.5 million salary become guaranteed). A: Hmm. I’m not really sure Seattle had a running back by committee last season, when you really examine it. Seattle clearly had a No. 1 rusher last season in Chris Carson, who finished with 1,147 yards, the first Seattle running back to top the 1,000-yard mark since Marshawn Lynch in 2014. Carson did so on 247 carries, which was the seventh most in the NFL last season. But more telling is that Carson, who missed two games due to injury, was third in the NFL in carries per game at 17.6 — the only two who got more carries per game were Dallas’ Ezekiel Elliott at 20.2 and the Los Angeles Rams’ Todd Gurley at 18.2. Carson has two years left on his rookie contract, and is due to make $645,000 in 2019. He can’t get an extension until after 2019 (which is something to watch next offseason but not a worry now). I fully expect Carson to continue to get that much work in 2019 and for Seattle to assume he can again handle it, which will factor in to its offseason decisions. As you note, Rashaad Penny will be entering his second season in 2019 and there’s no reason to think he can’t be more of a contributor, especially if he can avoid the nagging injuries he suffered as a rookie. Mike Davis, whom you mentioned, can now be an unrestricted free agent after spending last season as a regular in Seattle’s tailback rotation and main third-down, two-minute back. Davis played last season on a one-year, $1.3 million deal he signed last March — which came after he spent a little time exploring other options, including visiting Detroit, before the team drafted Penny. I think that’s important to note because when Davis signed, not only did the Seahawks not yet have Penny but they also were less sure in what they had in Carson, who missed the last 12 games of his rookie season with an ankle injury. Now, Seattle has Carson and Penny each for at least two more years, and also has 2016 third-round choice C.J. Prosise. And for sure, Prosise can hardly be counted on for much of anything at this point after missing 32 of a possible 48 regular-season games the past three seasons due to injury. But 2019 will be the final year on his contract and Carroll sounded optimistic last month about his chances for making an impact this season, saying the hope is an abdominal surgery Prosise had last season might finally do the trick. J.D. McKissic also could be back. McKissic now is a restricted free agent, and while I’d doubt the Seahawks will tender him — which will then make him a free agent — I’d imagine they’d try to then re-sign him. And he’d probably be cheaper than Davis — certainly less than the $1.3 million Davis got last season. So maybe that’s a long-winded way of saying I think it’s far from a guarantee that Davis will be back next season. 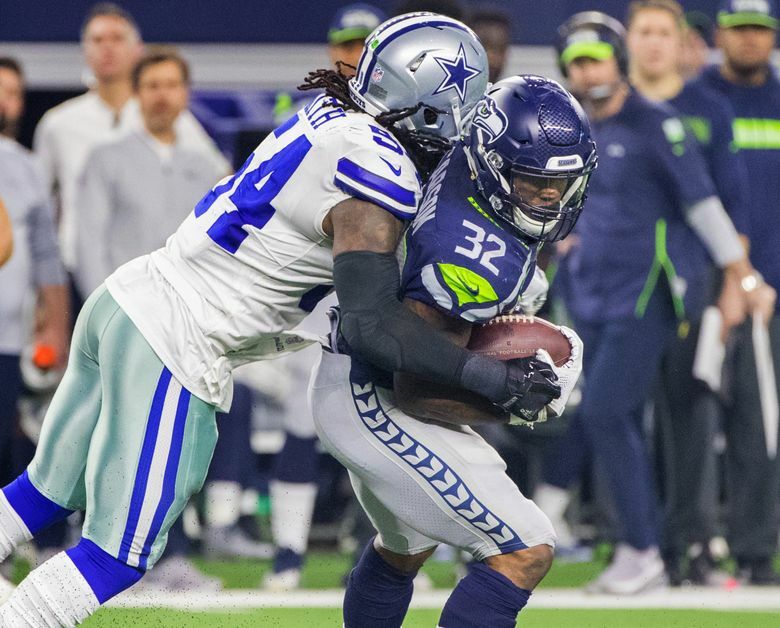 It’s also a way of saying that a backfield of Carson, Penny, Prosise, Bo Scarbrough and maybe/probably McKissic, running back might not be a spot the Seahawks have to do a whole lot to in the offseason.